The new Run It Twice tournament format, which has just been introduced by the ever-innovative Tonybet Poker site appears to be booming. To celebrate the launch of this unique format, the site is running the €15,000 guaranteed freeroll series which is set to end tonight with two events giving away €7,500 in free money. According to the site officials, the Run It Twice tournaments proved to be a highly successful addition to its game selection with each event attracting thousands of players eager for the chance to be dealt the board twice when they’re all-in. A good thing is that the Run It Twice series allows players to test the games for free with the opportunity to earn some pocket money. Since the Run It Twice format is unique in poker tournaments and has never been applied online before, here are a few helpful tips you may take advantage of when playing tonight’s events. Anyone, who has ever played poker knows that devastating feeling of a bad beat. When your opponent hits that lucky river, it’s a gruelling experience. 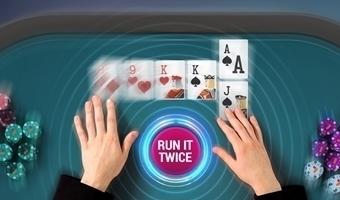 This is why Run It Twice is a magnet for many players – you get to run the board twice once you’re all-in reducing the chance of a bad beat to the minimum. In these types of tournaments the usual coin toss situations end in split pots. Every player would agree that it’s a much better result than losing your tournament life after running into opponent’s Ace-King with pocket Jacks. However, it’s also very important to note that things work the other way around as well. When playing Run It Twice your opponents will go all-in way more often knowing that even with a weak hand they might still get lucky. This also means they will be bluffing much more than usual. Don’t forget to use this to your advantage – be bold and aggressive, play loose, feel the pleasure of playing poker. The most important thing is to exploit the advantages of the Run It Twice format in order to achieve the final victory and bring home as much cash as you can. The first Run It Twice poker tournament series in online poker history at Tonybet Poker ends tonight with the two final events. The €2,500 guaranteed event kicks-off at 5pm GMT while the €5,000 guaranteed tournament starts at 7pm. Both events are free to enter with €3 re-buys.